I have a friend, a friend who is also a food writer and a vegetable enthusiast and a yogi. The first time she and I met, we ended up having a fifteen-minute conversation about sauce. We got on this topic because we’d been on the topic of bowls and how great they are (yes, we are every bit the food nerds that this anecdote would suggest). This created a natural segueway to sauces, because let’s be real: without a good sauce, most bowls are worthless. Normally, when I wax poetic about sauce, I’m thinking of all things tahini and miso and sesame and curry. But there are a lot of herb- and vegetable-based sauces, I love, too: pesto, chimichurri, and sunflower-ranch, to name only a very few. 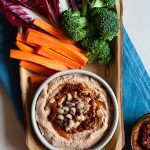 Romesco is one of my all-time favorite sauces, and it deserves a place on this list, too. 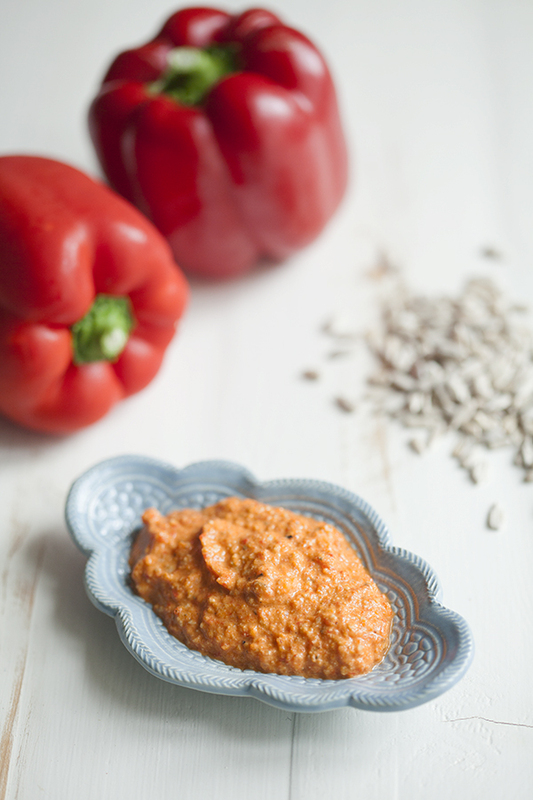 This is the first romesco sauce I’ve posted on this blog, and it is a keeper. 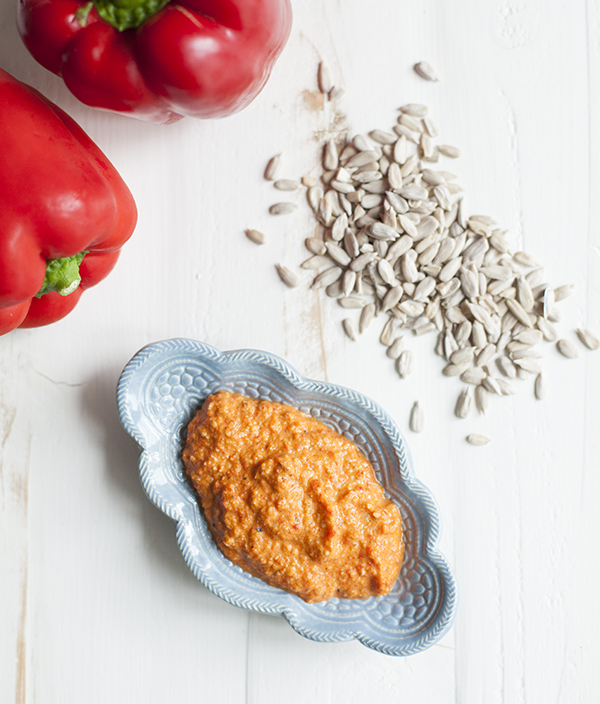 Romesco sauce, which originated in Northeastern Spain, is traditionally prepared with roasted peppers, almonds, pine nuts, and/or hazelnuts, garlic, and oil. 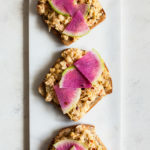 This version is nontraditional because I use sunflower seeds in place of tree nuts, and it’s so flavorful and rich that I don’t personally think it needs oil. It’s just the right compromise between something dense, like nut pate or hummus, and something loose, like dressing. I love using sunflower seeds in recipes because they are inexpensive and nutrient dense: chock full of Vitamin E, an antioxidant that may help to reduce inflammation and reduce the symptoms of inflammation-mediated health conditions, like arthritis; phytosterols that can help to reduce cholesterol; and thiamine, which may help with energy, digestion, and immune function. 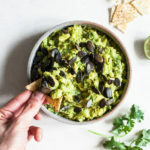 Some folks don’t care for sunflower seeds, and if you are one of them, you are welcome to use pumpkin seeds (pepitas), almonds, pine nuts, hazelnuts, cashews or walnuts in this recipe instead (almost any nut or seed will work, really). As far as the pepper goes, I welcome you to roast your own at home – with a little oven time, it’s easy to do. But if you use roasted red peppers from the jar (which you can find in virtually any grocery store), this becomes an easy sauce to whip up at a moment’s notice from your pantry. Place all ingredients except for the water into a food processor fitted with the S blade and pulse a few times to combine. Continue processing the mixture, drizzling the water in as you go along. You're aiming for a texture that is coarse but uniform and easy to spoon onto dishes. 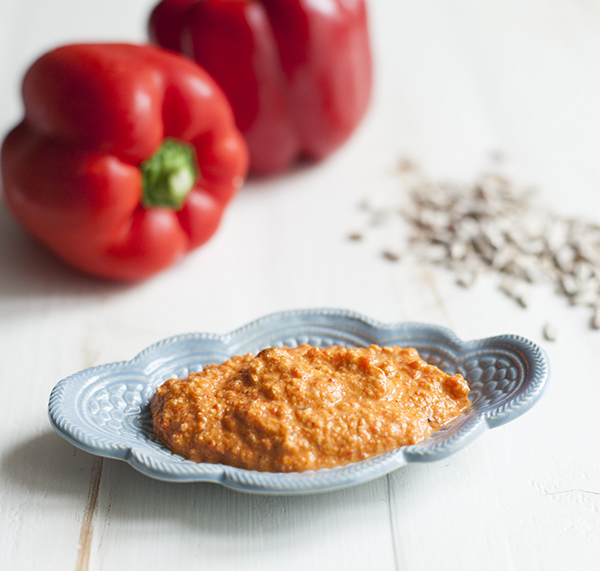 The romesco sauce will keep in an airtight container in the refrigerator for up to a week. One of the nicest features of this sauce is its versatility. Traditionally, it is served with fish, lamb, or spring onions, but I’ve always enjoyed it over whole grains, with grilled or baked tofu, or over roasted cauliflower. 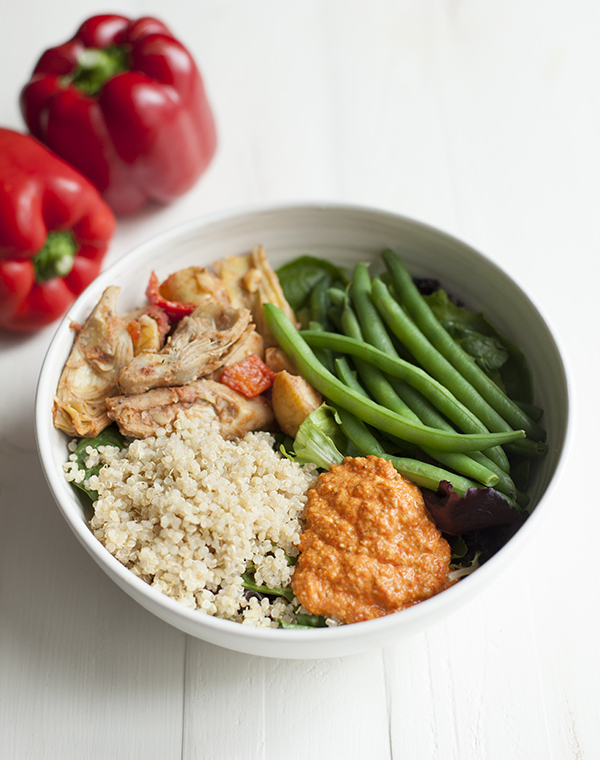 I also love dipping steamed green beans into romesco sauce for an afternoon snack that’s just a little fancier than regular ‘ole hummus+carrots. And speaking of carrots, it would be a wonderful dressing for roasted carrots, too. 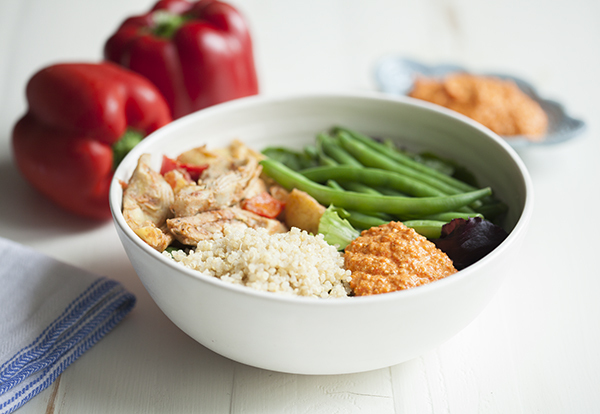 And of course, one of the best uses for any sauce is over a filling, nutrient-dense bowl. This beautiful lunchtime creation featured roasted new potatoes and artichokes, cooked quinoa, steamed green beans, and a bed of greens. And romesco sauce, which brought everything together in the nicest of ways. Hopefully you guys will have a chance to try the sauce soon—or perhaps even the bowl. It’s a perfect recipe to keep handy for summer grilling season, and well into the months beyond. Enjoy. And I’ll be back on Wednesday for an awesome new giveaway and product review! A really nice recipe for sunflower seeds. I like munching on those all the time. Wow I love it because you can use the sunflower seed romesco as a side dish. What a lovely looking bowl of food:) I ate a bowl of kale flowers, brocolli and chives last night – this sauce would have gone perfectly with it! 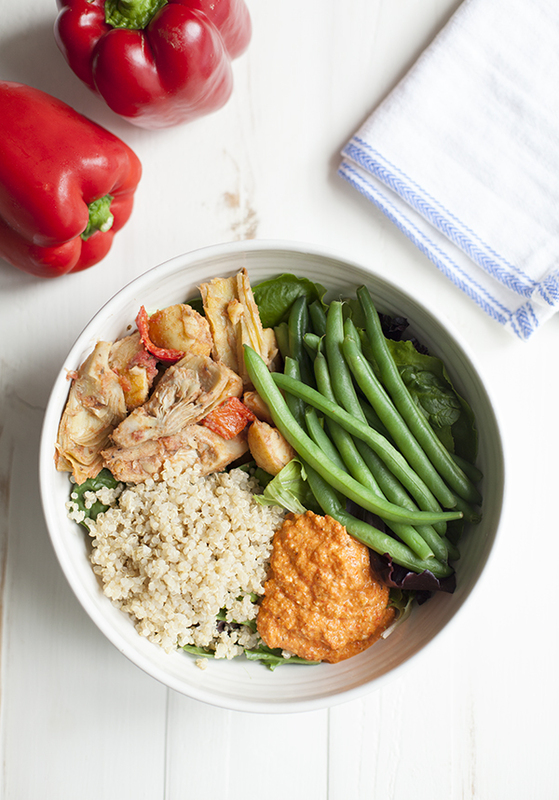 Thanks for this recipe – the romesco looks delicious. I agree with you about sauces – I read that French cooking is founded on sauces, and without a good sauce you just can’t have a great dish! Oh my. I’d eat that whole batch I think. Perfect flavor combinations Gena. And that bowl? I’d have that a couple times a week. 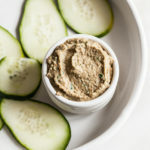 I love simple vegetables with a wonderfully strong flavorful dip / dressing. Looks perfect to me. Such a gorgeous bowl, wow! And this is such a nice and versatile recipe – thanks! Wow! these photos are making me hungry. Do you take them yourself, because they are very well set-out. But on the food side of things, I struggle with the eating well vs eating quickly. I do enjoy cooking but find it’s hard to find the time. So usually I’m just eating my sunflower seeds raw, with a few nuts. I think I need to expand my horizons a little. But if you’re going to roast the peppers, how long should it be? This sauce sounds great! I would love to try it with pine nuts, however I like how you used the more budget-friendly sunflower seeds which I will probably also do. I finally made this and it is fabulous and full of flavor! When my SO tried it his eyes widened as he exclaimed, “That is AMAZING!” I neither like nor dislike the flavor of raw sunflower seeds yet they work so well in this sauce! I’ve been eating it with veggie grain bowls and on toast topped with beans while my SO enjoyed it over pasta. I meant to double the recipe and started doing so with 1 C sunflower seeds when I realized I would need 2 jars of roasted peppers. So I ended up increasing some of the ingredients like salt, oregano, and lemon juice to suit our taste but used just 1.5 C. peppers. I did not need to add any water so maybe the peppers were too wet, but the final product was so delicious and a snap to make. Btw, I still regularly make and adore your cashew cheese! Thank you for inventing and sharing it! I made it three times this week. 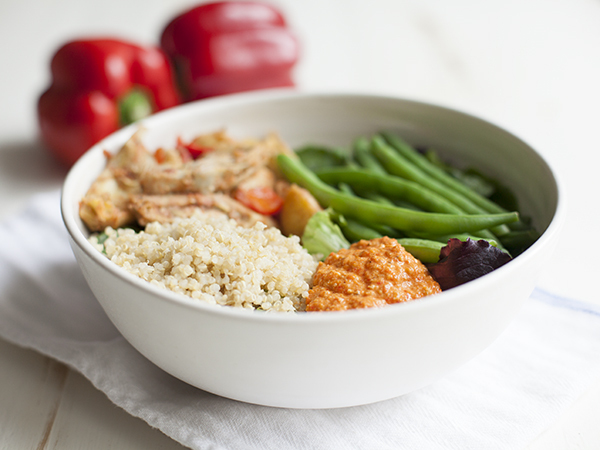 During cold weather I especially enjoy it in veggie-grain bowls. Of late I’ve been eating it with warm purple rice and black beans topped with Dukkah spice mixture. Quickest meal ever as I pre-make big batches of all three main ingredients! Hope others will try your super simple-to-make cashew cheese and romesco sauce. They make dinner taste so much better and also work for snacks! I look forward to exploring your books!